Ellingham Academy is a famous private school in Vermont, founded by an early twentieth century tycoon for the best and brightest students around. When Ellingham’s wife and daughter were kidnapped, the only clue was a mocking riddle listing methods of murder, signed with the frightening pseudonym Truly, Devious. Their disappearance became one of the great unsolved crimes in history. Many years later, true-crime aficionado Stevie Bell is set to begin her first year at the academy, and she is determined to solve this cold case. That is, she will solve it when she gets a grip on her demanding new school life and her housemates: the inventor, the novelist, the actor, the artist, and the jokester. But Truly Devious makes a surprise return. The past has crawled out of its grave, and someone has gotten away with murder. 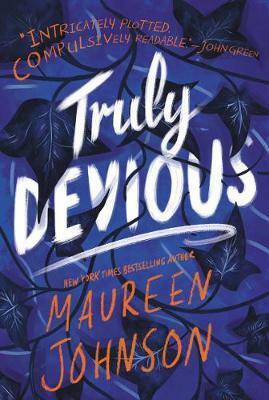 Truly Devious is the first novel in a murder-mystery trilogy by New York Times bestselling author Maureen Johnson.